10 things you might not know about INDIANA JONES AND THE LAST CRUSADE | Warped Factor - Words in the Key of Geek. Geek Dave digs up 10 things you might not know about 1989s Indiana Jones and the Last Crusade. 1. Chris Columbus (Home Alone, first two Harry Potter movies) wrote a script for what would be the third Indiana Jones movie. His story was titled Indiana Jones and The Monkey King. In it Indy headed to Scotland, fought some ghosts, discovered the Garden of Immortal Peaches (!) and then found the Fountain of Youth in Africa. The script was rejected, one of the reasons was down to negative African stereotypes, but it appeared online in 1997. At the time it was mistaken as the script for the fourth Indy movie. You can read the whole script here. 2. George Lucas then set about writing the treatment for the movie. He kept the ghosts and added a haunted castle. Steven Spielberg didn't fancy doing another ghost story, having recently made Poltergeist, so Lucas went back to the drawing board. This is when the Holy Grail idea came in. Again Spielberg wasn't keen, he thought the idea wasn't strong enough and that people would just quote Monty Python all the time. So Spielberg suggested a father and son story. The final draft was a compromise between the two. 3. It was always going to be difficult to find free time for all the major players to make the third Indiana Jones movie. Steven Spielberg, more than anyone, struggled to fit the film into his schedule. He had two other films that he was considering directing but opted to make Last Crusade instead. Those two movies were Big and Rain Man. 4. 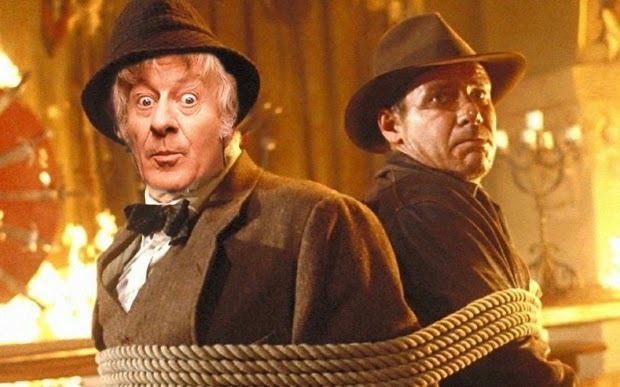 Sean Connery was always Spielberg's first choice to play Henry Jones, Indy's dad, but if the Scot hadn't accepted the role there were two back-up choices, Gregory Peck and the Third Doctor himself, Jon Pertwee. 5. As well as staring former James Bond 007, Sean Connery, Indiana Jones and the Last Crusade is a bit of a Bond film-fest. The film also features a former Bond ally (John Rhys-Davies), a former Bond girl (Alison Doody), two former Bond commanding officers (Michael Byrne and Billy J. Mitchell), a former Bond nightclub owner (Vernon Dobtcheff), and three former Bond villains (Julian Glover, Stefan Kalipha and Pat Roach). Harrison Ford's stunt double Vic Armstrong was also the stunt double for Sean Connery on Never Say Never Again, as well as doubling both Roger Moore and George Lazenby on Live and Let Die and On Her Majesty's Secret Service respectively. One more Bond nod for you, the gun used to shoot Henry Jones is a Walther PPK, the same model Sean Connery used when he was Bond. 6. Sean Connery found filming the Zeppelin scene particularly difficult because it was so hot. So he stripped off his bottom half and walked on set in his underpants. As a show of 'father/son' solidarity Harrison Ford joined him. Next time you're watching remember that both are only in their underpants. 7. Indiana Jones' horse was becoming a bit of an A-list animal back in the day. He'd just finished filming Rambo III. In case you were wondering he played John Rambo's horse in that movie. 8. The script had no mention of Dr. Jones Sr having a relationship with Elsa, until Sean Connery improvised the line "She talks in her sleep". The whole crew started laughing, Steven Spielberg stopped the shoot and announced "Well, that's in!" 9. In the credits there is a character named Fedora who is played by Richard Young. However in George Lucas' script that character is called Abner Ravenwood. Recognise the name? Abnor was Marion Ravenwood's father and Indiana's mentor who was mentioned in Raiders of the Lost Ark. 10. 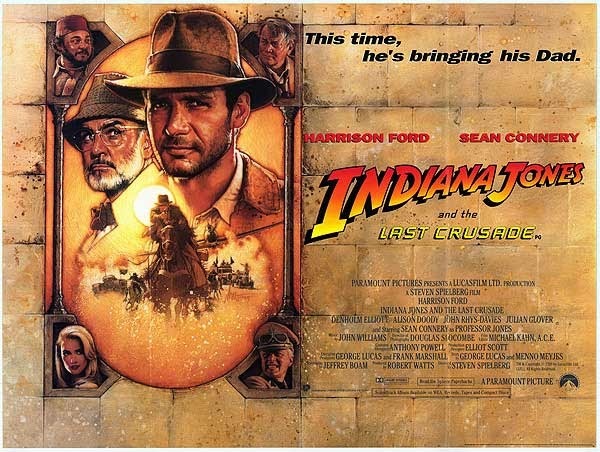 Now we all know that at the end of Last Crusade Indiana explains that he took his name from the family pet dog. But you might not know that this is kind of true. Indiana was George Lucas' dog, an Alaskan Malamute, that he owned in the 70s when he first started writing what would become Raiders of the Lost Ark. This was also the period he started working on the Star Wars saga, and the same dog inspired Chewbacca. So Harrison Ford has played a character named after Lucas' dog and been best friends with a character inspired by Lucas' dog! Bizarre.